Updating your home inside and out can be as simple as applying a fresh coat of paint or stain. We can help you find the right painting and staining supplies to help you transform the "before" into an "after" you’re sure to enjoy. Since preparation is just as important as the paint or stain job itself, set yourself up with some must-have accessories. Take a few moments to repair small holes in the walls and fill in cracks and crevices around doors and windows. Then, smooth down the rough spots and create clean edges by applying masking tape around windows, doors and where the walls meet the ceiling and floor. When you've chosen your paint color and finish, there are a few standard painting tools to have on hand such as paint trays and brushes. Many tools will help speed up paint application including step ladders to help you access sports that are out of arms reach. And, when you've finished, remember to clean your equipment using soap and water. With the right care, these tools can be used more than once, saving you time and money. Deciding how much paint to buy for your project can be a challenge. The Ace Paint Estimator is available to help you do some at home planning. All you need to do is answer a few simple questions about the room or walls that you are working with and the Estimator gives you a quick estimate on how much Ace Paint you'll need. If you’ve noticed a crack between your shower tile or a slight gap where your window frame meets the wall, chances are you could use some caulk. 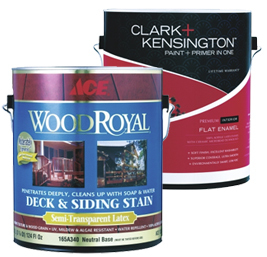 Often easier to sand, paint and stain, acrylic caulk tends to blend in well with the materials surrounding it. Silicone caulk, however, is more flexible and because of this wears longer in many different environments. And as formulas improve over time, you’ll find many paintable varieties exist in the market today. Though there are squeezable tubes of caulk available, the cleanest application possible can be achieved with the help of caulk guns. Caulk guns are designed to help provide more control over both the flow and application of caulk. And, when you've finished, remember to clean your painting equipment using soap and water. With the right care, these tools can be used more than once, saving you time and money.